Just when you think that Prime Mister Theresa May cannot humiliate Great Britain any more in her attempt to override the will of the people and keep them locked inside her beloved European Union, she plumbs new depths. 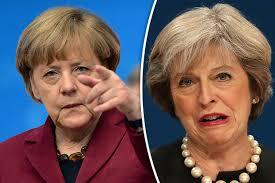 In her desperate attempt to avoid Great Britain leaving the corrupt and failing United States of Europe she has already begged the President of the European Council, Donald Tusk, to extend the leaving period to get her Withdrawal Agreement through Parliament before the legal leaving date of 29th March, 2019. This was granted and the period extended to April 12th, 2019. This Withdrawal Agreement is a surrender document which was not negotiated by both parties but created by EU bureaucrats and designed to keep Great Britain locked inside their institutions in perpetuity. It has already been defeated in Parliament three times with little chance of it passing at the fourth time of asking. In a move reminiscent of a politician that cannot accept the end is nigh she ignored her own party and the British people by inviting the Leader of The Opposition, Jeremy Corbyn, into a coalition to get this surrender document through Parliament with his support. Jeremy Corbyn is the unapologetic Great Britain hating communist that Mrs. May has been deriding for the last two years as a disaster in the making and unfit to govern. This virulent anti-Semite will demand that Great Britain remains inside the EU institutions but in search of a bigger prize he is likely to withhold his support in the hope of triggering a general election which will propel him into the power. There is nobody in a leadership position in Britain who wants out of the EU. None of them care about what the people voted for, or what is good for Britain. Power and privilege conquers all. Their goal, and it probably will be successful, will be to break the morale of any opposition and try to get them to give up on that strange concept of having the government listen to the serfs. Worst case they will have an election where the choices are stay in the EU, or get nominal independence but yielding all important powers to Brussels. At least until power is transferred to a mosque in Tours. The question that needs to be answered is what, if any, relationship we should have with a Britain that is not independent or sovereign? Or the country that was our start on being free anymore.